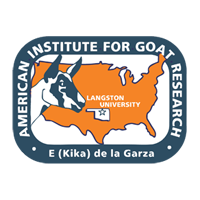 Fourteen Boer (75%) x Spanish wether goats (51 ñ 1.8 kg BW and 23 months of age) were used to determine effects of a moderate degree of nutrient restriction on heat production or energy expenditure (EE). The experiment consisted of a 26-day period (P1) followed by one of 50 days (P2). Wethers were fasted on the final 4 days of each period, with gas exchange measured on the last 2 days. Fasting was preceded by collection of feces and urine for 7 days, with the final 2 days for gas exchange. All wethers were fed a 60% concentrate diet at a level of intake near maintenance in P1 (P1-100 and P1-80 treatments). In P2, six wethers continued on this level of intake (P2-100 treatment); eight wethers also were fed at this level for 15 days but then had ME intake sequentially reduced by approximately 10 and 20% for 10 and 21 days, respectively (P2-80 treatment). Intake of ME was lowest (P < 0.05) for P2-80 (529, 535, 552 and 474 kJ/kg BW0.75 (fasted) for P1-100, P1-80, P2-100, and P2-80, respectively). Fed EE was lowest (P < 0.05) for P2-80 (495, 505, 467, and 406 kJ/kg BW0.75), whereas that while fasting was similar among treatments (287, 279, 273, and 253 kJ/kg BW0.75 for P1-100, P1-80, P2-100, and P2-80, respectively). The ME requirement for maintenance (MEm) was greater (P < 0.05) in P1 than P2 (477, 487, 421, and 376 kJ/kg BW0.75 for P1-100, P1-80, P2-100 and P2-80, respectively), and when analyzed for P2 separately MEm was lower (P < 0.10; 374 vs 425 kJ/kg BW0.75) and the efficiency of ME use for maintenance was greater (P < 0.08) for P2-80 than for P2-100 (0.689 vs 0.625). In conclusion, moderate feed intake restriction impacted EE and MEm by mature meat goats largely via decreasing EE associated with or responsive to nutrient intake or workload rather than physiological processes responsible for fasting EE.